Acer 4551 (CR2016-WRS) CMOS RTC Battery. Type: Lithium Manganese Dioxide. Voltage: 3.0V. Capacity: 75 mAh. Length of Flex: 40 mm. Height: 1.6 mm. Diameter: 20 mm. 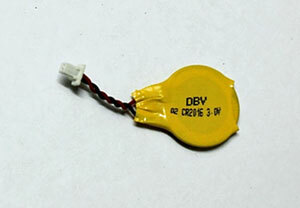 Functional replacement for: CR2016-WRS, for Acer 4551. This small battery is commonly used in Acer 4551 laptop computers. Our battery is a geniune replacement for the CMOS battery mentioned. This battery can be used in many Acer 4551 laptop computers.